Hula Hooping Mom: "HOP" Giveaway!! Spring is my favorite time of year! The weather is usually comfortable, the kids start their baseball season and we celebrate one of the most important holidays of the year; Easter. From the maker of Despicable Me comes an all-new comedy about candy, chicks and rock n roll! He was destined to be the Easter Bunny, but all he wanted to do is rock! When teenage E.B. (voiced by Russell Brand) leaves for Hollywood in pursuit of his dream to become a rockstar drummer, he meets Fred (James Marsden), an out-of-work slacker with his own lofty goals. Together the two encounter a series of hilarious mishaps and misadventures and in the end help each other recognize the importance of family. Now available on Blu-ray & DVD! Universal Studios Home Entertainment is giving one of our readers their very own HOP Blue-ray combo pack and a HOP Nintendo DS game. The Blu-ray Combo Pack includes an All-New Mini Movie and additional content to extend the fun even more. 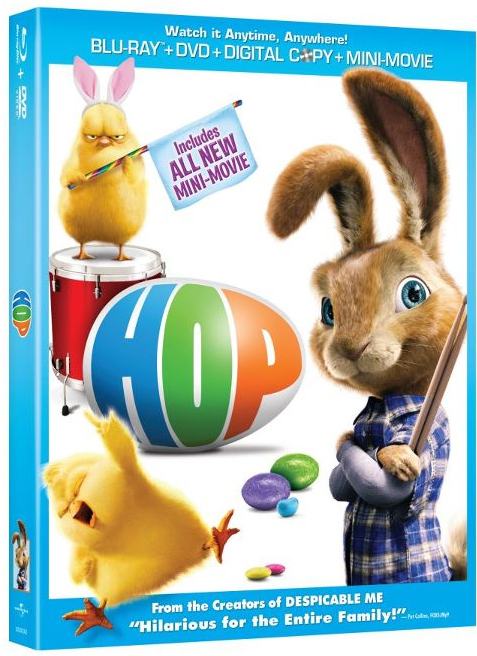 Plus it has 3 ways to watch so your family can enjoy HOP anytime, anywhere (Blu-ray + DVD + Digital Copy)! Mandatory Entry - Visit HOP's official website & tell us what your most looking forward to! Contest will end April 2ND, 2012 at 5pm Pacific time. Contest is open to US residents only and must be 18 years of age or older to win. Leave one comment per entry. Please make sure there is a way for me to contact you. One winner will be selected at random and contacted by email. Winner will have 48 hours to contact me with their costume choice and address, or a new winner will be chosen. Prizing courtesy of Universal Studios Home Entertainment. No compensation was received for this feature. Universal Studios Home Entertainment did provide a copy of the movie for our review.